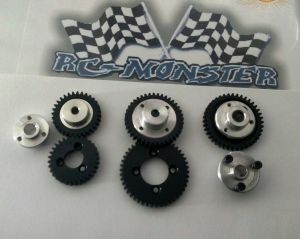 Stock chassis conversion kit for popular Hot Bodies D8 buggy and D8T Truggy. Kit includes cnc machined motor mount, single servo/rx box with integrated antenna mount and battery/ESC tray. All items bolt directly onto stock chassis - no modifications required. Retains use of stock chassis, mud guards etc. - simple, effective, bolt-on conversion with factory look, fit, finish and quality. 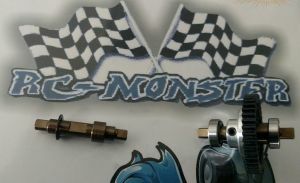 Custom servo/rx box allows access to motor pinion without modifying the motor shaft or stock rx box. Directly replaces stock piece - no modifications. 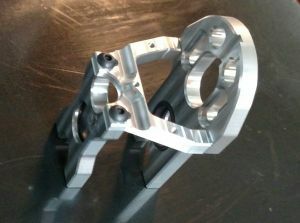 Integrated battery/ESC tray cnc machined from 1 1/4 pound block of plastic for precision fit. 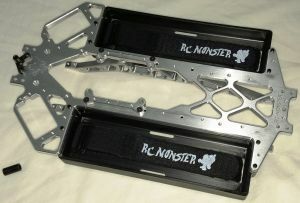 Finished tray weighs only 3 ounces, includes accommodations for most or all 1/8 ESC on the market currently, with matching bolt pattern to allow Tekin RX8 and Castle MMM(with Traxxas esc mount - #5626) to bolt directly to tray. CNC Milled underside allows ESC wires to be routed under tray, resulting in a super clean, easy to remove and easy to service installation. Battery tray allows most available packs to be used - 51.5mm x 160mm inner tray dimensions. Entire electronics can be removed from chassis kit by simply removing 12-14 screws(depending on if motor or entire center diff/motor are removed) - nothing needs to be unplugged, unsoldered or adjusted. 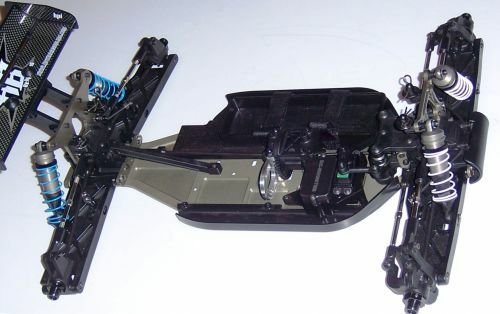 Unique feature allows quick and easy cleaning and maintenance with no adjustments necessary - entire center section including the servo, esc, motor and center diff can be removed or installed in under 2 minutes. All components promote super low Cg for optimum handling. Weight balance optimized with the stock chassis configuration for predictable and responsive handling characteristics. Light weight components - entire kit weighs only 6oz and replaces over 12oz of original components(excluding brake servo and rx battery!). 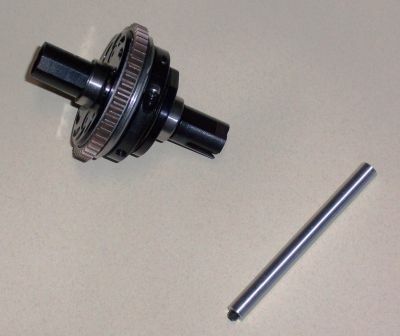 Slipperential (Patent Pending), pinion and optional components and/or electronics shown are available separately but not included with kit - requires Hot Bodies D8 Buggy or D8T truggy kit for conversion. ok fit and finished product except i had to cut about a 8th inch off my castle motor. This kit is very well made, But it does not fit the Hpi vorza at all. Not a single screw hole lines up in the chassis, I tried it. Note - are you sure you have a Vorza? The Vorza is a D8 under a different name, so it should be a direct fit. I just finished converting my D8T and am really happy with result! Everything fits great and looks tough. Can't wait to try at the local track once snow completely thaws. Thanks Mike & company for the great products! Very sturdy. Fitment was perfect, and it stood up to all my abuse. Finish on the parts was flawless as well.